Throughout history, hegemonic power has appeared as the king, the caliphate, the shepherd of the earth, the head of the state, etc – all of which have re-produced the masculine hierarchy-based understanding of nature. This is why political ecology, as a tool to investigate the links between political decisions and ecological outcomes, can and must also investigate the historicity of those links. 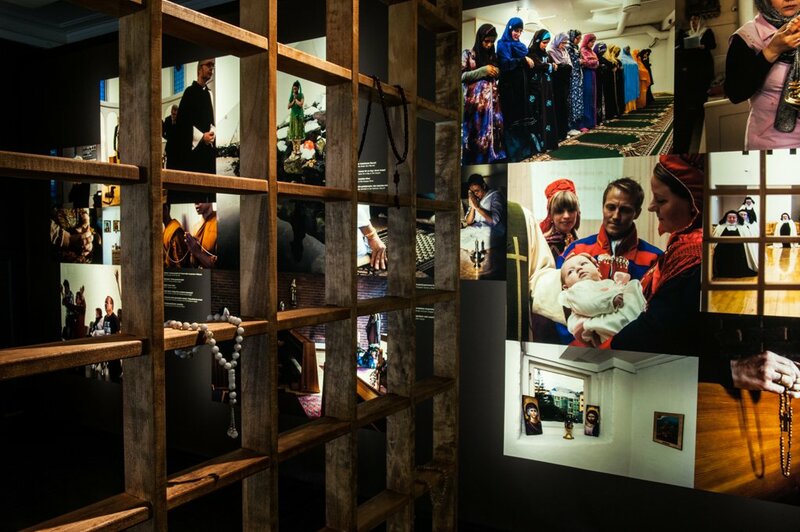 Photo by Mari Hildung, Perspektivet Museum, Tromsø. On July 1st, I defended my PhD thesis. After that my mother’s health dramatically worsened and we lost her on September 16th. She had been working as a high school teacher until she was diagnosed with cancer. She had a more special relationship than most teachers with their students – always paying a lot of attention to their ideas and feelings. This was mainly based on her belief in a society formed of free-spirited individuals who read and question. Now she is not with us anymore, but we still need to find a way for a society composed of free-spirited beings. This necessitates a much broader vision than one of a free human society. For this reason, we should re-consider our knowledge about nature on a non-hierarchical basis. Doing this with rigour led me to investigate and question monotheistic religiosities as the cause of hierarchically-based knowledge about nature. My thesis, entitled the Political Ecology of Islam-Nature Relationship, focuses on the problem of a hierarchy-based interpretation of nature. This work is built upon two assumptions. Firstly, that knowledge has historically been the main instrument to transform nature. And secondly, that political ecology can help us criticise the processes of knowledge production. Based on these assumptions, I argue that the mainstream ways of interpreting nature and producing ecological knowledge have historically secured the hierarchies in private and public scenes, and religiosity has always been profound in the root of dominant knowledge. Here, religiosity is used to signify the state of mind that approaches knowledge through the lenses of sacredness and absoluteness. The individual generally has the tendency to sacralize and absolutize what s/he has been taught to believe; there is no – or very little – room for suspicion, but an intense tendency towards marginalization and violence. Therefore, there might be a need to focus on the homo-religiosus. Here, homo-religiosus is re-defined as the masculine individual – not necessarily a man – whose mind-set is surrounded by sacredness and absoluteness. This mind-set, shaped mainly by religious monotheistic interferences, has a tendency to act through sacredness, and so, absoluteness of the knowledge s/he has been taught, and to marginalize any alternatives to this knowledge. Today, it is not easy to exempt both religion(s) and science(s) from such monotheistic epistemology. In history, both sacredness and absoluteness have appeared as the main characteristics of knowledge about nature and human societies. For instance, the idea of the uniqueness of “God” has become a sacred belief at a particular historical stage, and monotheism has been absolutized as the only possibility, thus becoming part of hegemonic knowledge. Accordingly, alternative conceptualizations of the Universe have become marginalized. This monotheistic interpretation of nature justifies the hierarchical organization of its members – of which human societies are also a part. In this respect, the 1579 drawing of Didacus Valades can also be interpreted as an example of how the homo-religiosus approaches nature. Although “all that is solid melts into air” during the modern era, human thinking never became totally secularized, and continued to produce various types of sacred and absolute knowledges about nature. While traditional ideas and values were substituted by modern ones, especially through the efforts of (positivist) scientists, the mentality behind these changes remained for the large part, religious. In other words, science – combined with industrial attitudes – has created its own religious rituals aiming at new ways of subjugating nature. Science and industry’s active support – until today – to capitalist systems or nationalistic projects, can also be linked to this mentality. 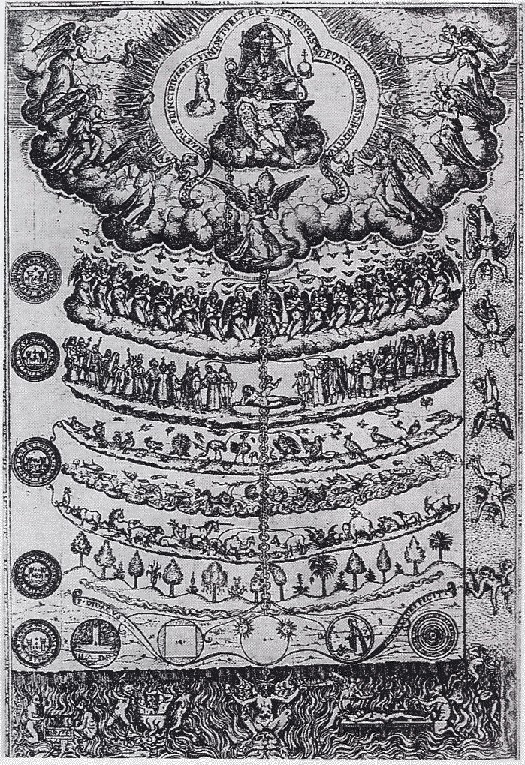 1579 drawing of the Great Chain of Being from Didacus Valades, Rhetorica Christiana. Source: wikipedia.org. At this point, the discussion on religiosity might help us re-think what Max Horkheimer insisted on in the Eclipse of Reason many years ago: “The history of man’s efforts to subjugate nature was also the history of man’s subjugation by man.” The banalization of the historical relationship among the different entities of what constitutes nature, is very much related to the ecological knowledge produced by the “religious” man – i.e., the masculine mind, in general. Throughout history, hegemonic power has appeared as the king, the caliphate, the shepherd of the earth, the head of the state, etc. – all of which has re-produced the masculine hierarchy-based understanding of nature. This is why political ecology, as a tool to investigate the links between political decisions and ecological outcomes, can and must also investigate the historicity of those links. The outcome of the above-mentioned historical links was very well identified by Carl Sagan. We think that something similar to our political system is running the Universe. But what if it’s not? Obviously, this unproven belief in a hierarchy-based perfection of nature has resulted in a closed circuit historical system. Under this system, the hierarchy-based understanding of nature stems from our hierarchy-based masculine societal organization, which is guaranteed by our political system as the outcome of the same societal organization. Within this context, we have been witnessing the banalization of the ecological crisis – not the crisis of nature but the crisis of the relationship between the masculine hegemon and the others. The mainstream knowledge produced by the hegemon is against the interests of others and is still not open to questioning. The long-term historical shifts from tribes to nation-states and from a religious era to a scientific one, have not made that much effect on the hegemon’s relationship with knowledge. In this respect, one may find a correlation between sexism, speciesism and the marginalization of other knowledges. Even if some religious calls are made for a re-conceptualization of human rights, they never do this for a broader “us” free from sexism and speciesism. However, independently from its source, the calls for a free and just society must be based on a broader conceptualization of being that enables a non-hierarchical relationship between beings. *Çağdaş Dedeoğlu holds a Ph.D. in Political Science and International Relations and focuses mainly on the themes of political ecology, sustainable security, power & knowledge, religion, and violence. You can find him on Twitter as @CagdasDedeoglu. For a detailed publication list click here.